How are the plants obtained? How are the plants planted? What species are selected for out-planting? From pollen and other data in core samples, we have a reasonable idea of what plants were likely most abundant around Kawainui Marsh prior to the arrival of Polynesians. But, as discussed under Restoration, that ecosystem existed too far back in time for us to seriously consider as a restoration point. Our interest is in providing a landscape that would be familiar to a Hawaiian a few thousand to several hundred years ago. We therefore consider for planting any species we know (or believe) was present before Capt. Cook arrived in 1778, and reject as a weed any plant not present in the Islands before that date. How and from where are native plants obtained? We obtain our plants from a wide variety of sources. Many are donated by individuals. However, the majority come from the personal nursery of the author (E. Guinther), a nursery developed for the single purpose of providing free out-plantings to Nā Pōhaku o Hauwahine. This home nursery yields on the order of 400-500 plants annually. Another source of plants is the world's largest Hawaiian native plant nursery, Hui ku Maoli Ola, as either donations from Rick and Matt (mahalo nui), or as purchases made by ‘Ahahui Malama i ka Lokahi using grant monies. Plants from Guinther's nursery are grown from seeds or cuttings. Increasingly, seeds (and all cuttings) come from mature plants at Nā Pōhaku o Hauwahine. Otherwise, seeds are collected from all over the Hawaiian Islands. We encourage our volunteers and visitors if interested to take seeds from the park and supply plants back to us. The source of our plants brings up a concern expressed by some. Should not all of our plant material come only from the Island of O‘ahu? We do consider this a serious question, and make decisions on a species by species basis. First, we do not control the source of all the plants donated or sold to us. However, we are not planting into an existing native ecosystem or close to one (except what exists in the marsh itself). Our hope is to restore an assemblage comprising strong populations of lowland native species; we seek the widest genetic diversity to accomplish this. For the vast majority of species planted, no clear distinction exists between the species found on one island and that same species found on another island. Where such a distinction can be made at or below the variety level, we would have concern in but a very few cases. We do plant species that are not now known from the Island of O‘ahu. For out-planting purposes, our project is closer to an experimental garden than a retoration by plantings back into nature. We are creating a setting of educational and cultural significance, not an exact replica of an ecosystem that existed hundreds of years ago. We do not wish to exert the kind of control over what comes in that such "perfection" would require <1>. 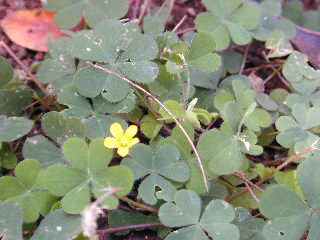 ‘ihi‘ai (yellow wood sorrel, above) is a moderately common weed in lawns and gardens. However, documentation exists that this species was present in Hawai‘i before the arrival of Capt. Cook. Although possibly an indigenous species, it is more likely an early Polynesian introduction, perhaps accidental along with purposeful canoe plans. Either way, you will see this small ground cover preserved at Nā Pōhaku o Hauwahine, especially along the trails where it appears in abundance in the wet season. It is not a clover. How are the plants planted and watered? We do not engage in a lot of "tender loving care" for the plants we out-plant<2>. In the nursery, plants proceed through a series of plastic pots of increasing size, typically with the last move into soil obtained from Nā Pōhaku o Hauwahine and amended with a liberal dose of granular fertilizer. When deemed of sufficient size to move to field planting (typically within a year or less and dependent upon rainfall received), a hole is dug slightly larger than the potted specimen, filled with water, which is allowed to soak in, and the plant put into the hole. Soil is added back in as needed with fairly vigorous tamping to be sure the pot soil and the site soil are well integrated. As a general rule, plants are moved out of the nursery as fast as possible to avoid them developing an attachment to regular watering or any special care. The watering done at Nā Pōhaku o Hauwahine at planting is usually the only water we provide the plant. If conditions become drier than expected, an additional watering may be called for a week later. After that, the plants are on their own. Note <1> –The idea of purity in genetic material raises a number of interesting questions. For example, a large nā‘ū (Gardenia cf. brighamii) located at the base of the pohaku nui was tested by Shelly James at the Bishop Museum for genetic purity and found to be likely a cross between G. brighami and Gardenia taittensis from the Society Islands (a common problem with most nā‘ū outside of the wild where very few now exist). This plant is large, frequently covered with fragrant blossums, and difficult to distinguish from pure G. brighamii plants. We are not interest in destroying this plant, despite its questionable parentage. However, we would discourage its use as a source of seeds for any purpose. Note <2> –More akin to "tough love" exzceptions are sometimes made for special or rare plants under a circumstance of expected rainfall failing to appear. Still, watering is not done on a continuous basis for any of the plants. This latter gardening practice would defeat the basic premise of the restoration that each species must find its own way populating the site. We try to provide only two things: 1) multiple attempts to put a species into different conditions that exist on the site, and 2) removal of competing non-natives. Page last modified: January 6, 2014 by Webmaster (webguy@aecos.com). © 2010-2014. Eric B. Guinther ~ All rights reserved.